In her long life, Consuelo Vanderbilt Earl had many claims to fame, both locally and nationally. One was the fact that for years she operated what was considered almost a small zoo on her West Mountain estate. Another was her ancestry: She was a great-great-granddaughter of Commodore Cornelius Vanderbilt, the American financier who amassed a huge fortune in railroad and shipping interests, and she was a grand-daughter of a U.S. senator who helped develop the Comstock Lode. Yet another was her own wealth. In the 1930s, as a young woman during the Depression, she reportedly had a personal income of around $1 million a year (about $17 million today). “She was among the last surviving links to an era when the Vanderbilts personified the opulence and grandeur of the country's gilded elite,” said The Washington Post in her obituary. 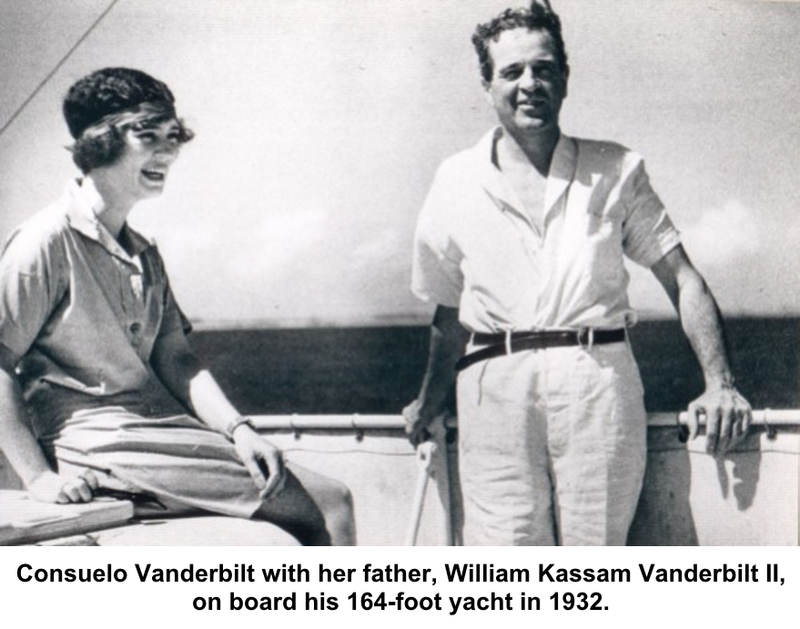 Consuelo “Consie” Vanderbilt was born in 1903 in New York City. Her father, William Kassam Vanderbilt Jr., and his father, were presidents of the New York Central Railroad. Her dad was also a well-known yachtsman and a race-car driver: In 1904, he set the one-mile land-speed record by traveling 92.3 mph in a 90 horsepower Mercedes on the beach at Daytona, Fla. Her mother, Virginia Graham “Birdie” Fair, was a daughter of U.S. Senator James G. Fair of Nevada, a 49er from the California gold rush era and one of the “Silver Kings” of the Comstock Lode in Nevada. She grew up at her family’s mansion on Fifth Avenue in New York and spent her summers at the family home, Eagle’s Nest, on Long Island, and in Newport, R.I., She often sailed with her father aboard his 164-foot yacht, Alva, named for his mother. She was married four times. Her first husband was Earl T. Smith, and their 1926 marriage got front-page coverage in both The Washington Post and The New York Times. He was a Yale student, polo player, and champion boxer who became a business executive. That marriage ended in divorce — Smith subsequently married and divorced two more women, and died married to his fourth wife. Consuelo did the same, marrying and divorcing two more business executive husbands before becoming the wife in 1951 of Noble Clarkson Earl Jr., an executive with Howard Johnson restaurants and Louis Sherry ice cream, who had been a major in World War I and a colonel in World War II. (Oddly enough, her first husband’s first name was her last husband’s last name.) N. Clarkson Earl died in 1969. Mrs. Earl, then known as Consuelo Smith, acquired a 26-acre country home at the intersection of West Mountain and Rippowam Roads in Ridgefield in the late 1940s. She named it Iradell Farm — Iradell, she said, came from the name of her first daughter, Iris, and a “dell” that was a prominent feature of Eagle’s Nest, the Vanderbilt family home on Long Island that is now a museum). For a while the Earls had a wallaby and its joey. Alas, “kangaroos do not make good pets,” Mrs. Earl said in a 1962 Ridgefield Press interview. “And they’re not very friendly. After I feed an animal for three years, I certainly expect them to let me get close to them. They wouldn’t, so we traded them to the Catskill Game Farm,” a zoo in New York State. But Iradell Farm’s real business was dogs, which the Earls bred and sold for years. 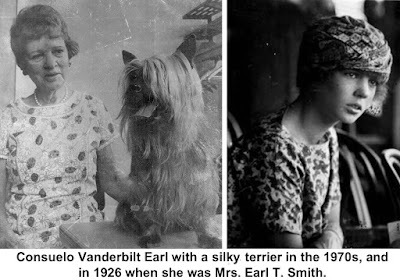 Consuelo Earl was a longtime breeder of terriers, especially Skye and silky terriers. For the latter breed, she helped gain official recognition from the American Kennel Club in 1959. The Earls also raised toy poodles, mostly because they were popular and sold well. “How many dogs do you have?” asked interviewer Linette Burton. Consuelo Vanderbilt Earl’s final claim to fame occurred in 2011, the year she died: She was 107 years old. She had been quite possibly the oldest Ridgefielder ever.